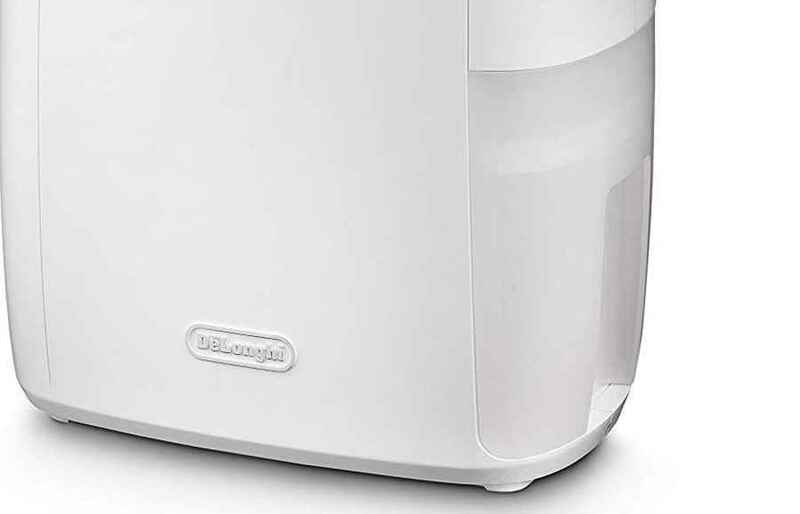 If you are looking to invest in a dehumidifier, DeLonghi is a brand that shouldn’t disappoint. Regarded as one of the best dehumidifier manufacturers in the market, DeLonghi is similar to Meaco when it comes to innovation compared to their competitors. And, whilst the brand has a lot of options to choose from, in this guide we have decided to look at the DeLonghi DEX12 because it makes a good first-buy dehumidifier. From one of the latest in DeLonghi range of dehumidifiers, the DEX12 is the younger sibling to the DEX10 but an older brother to the DEX14 & DEX16. Being the second in its line, the DEX12 improves on the capacity and design of the DEX10 but lacks the sophisticated look and functionality of the DEX16. The DeLonghi DEX12 also uses less power and has a lower price tag than both the DEX 14 & 16. Therefore, this dehumidifier is worth considering if you want a high-quality unit but don’t want to splash-out the cost of high-end models. The DeLonghi DEX12 also has a lot of qualities you’ll find in the Finether 12L Dehumidifier. Both are multipurpose units that dry clothes and clean the air in addition to drawing out excess moisture. Both dehumidifiers also have a maximum moisture capacity of 12L, removable transparent water tank, easy-carry handle, and the availability of a continuous drainage hose. The DEX12, however, costs £50+ more than the Finether 12L/D (at the time of writing). So, is it worth the extra money? In this guide, we’ll cover every key feature you need to know about the DEX12 to help you make an informed buying decision. The DeLonghi DEX12 features a unique design that we think looks rather elegant. Unlike other models, where a built-in handle is designed to either fold down or tuck away, this dehumidifier from DeLonghi has an integrated handle that remains upright at all times. There are no wheels at the bottom. Therefore, you will have to carry the DEX12 when you want to move it around the house. This will not be too challenging though because the DEX12 weighs in at a reasonable 9 kilos. The unit’s compact 22 x 50.2 x 33.4 cm size (the equivalent of a medium backpack) also aids in making it easy to transport. Another unique thing about the DEX12 is that there is no control panel on the dehumidifier. 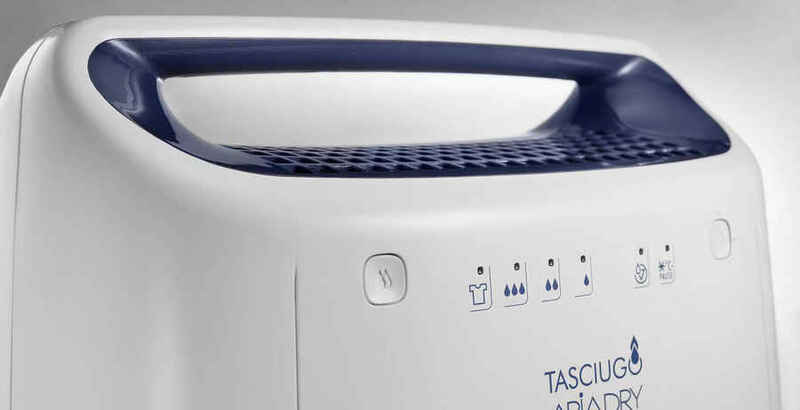 The appliance has electronic controls that are integrated onto the dehumidifier itself. The controls include an On/Off power button and a function-setting button. Both of these controls are situated at the front of the unit. In between the 2 buttons are tiny light notifications (with accompanying graphics), which glow to indicate the current setting and to show when the tank is full. The DeLonghi DEX12 is a refrigerant dehumidifier. This means it works by drawing in moist air. It then cools rapidly before releasing air back into the room in a dryer state at ambient temperature. The rapid cooling part of the process results in the formation of tiny droplets of water that trickle down slowly into the dehumidifier’s 2.1L tank. The DEX12’s side-loading water tank can hold 2.1L before emptying. Which is not the largest we’ve seen but should be adequate for most homes. In a full day, (i.e. 24 hours), the dehumidifier is able to draw out up to 12 litres of moisture. This extraction rate, however, is arrived at with the DEX12 running under a temperature of 32°C and a relative humidity of 80%. Therefore, the extraction rate can be more or less than the indicated 12L of moisture a day depending on the environment where the dehumidifier is installed. In the UK, the weather does not typically arrive near the tropical conditions that would yield 12-litre moisture extractions per day. The maximum amount of moisture we’d advise you to expect drawing from UK homes, on average, is between 1 to 2.5 litres of water per day (again depending on temperature and humidity conditions). The DEX12 has 3 humidity settings to choose from, which can be set to 40%, 50%, & 60% RH. Selecting your preferred relative humidity (RH) is easy. All you have to do is simply press the function button until the light notification representing your intended target comes on. This is more than adequate for many needs but it would have been nice if Delonghi had allowed for a more granular control when selecting the RH. Many dehumidifiers allow you to configure the RH percentage in 5% increments. Although the available 2.1L tank is bigger than that of the Finether 12L/D, it is slightly on the small size. More dehumidifiers are featuring 2.5-3 litre tanks with some even offering a generous 5L water tank. 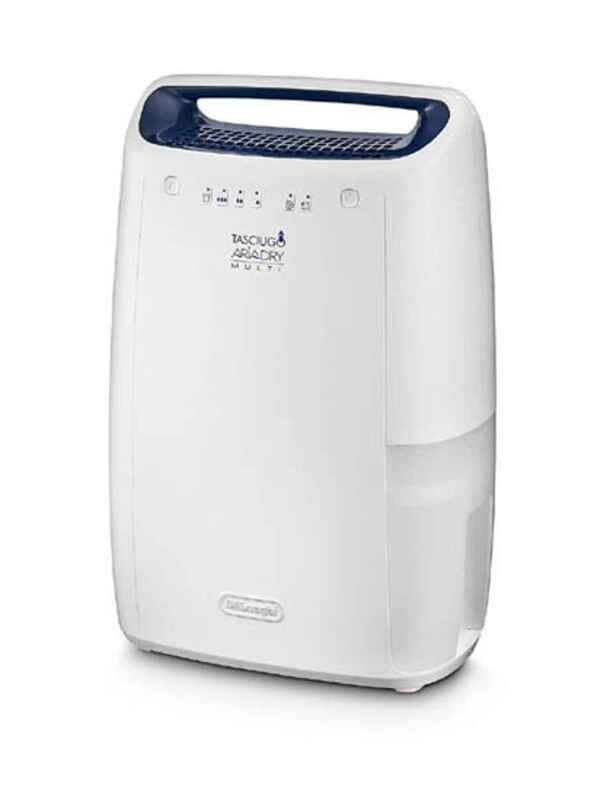 In terms of handling, the DEX12 dehumidifier has a water tank that empties very easily. This can be attributed to a number of factors. For starters, the tank is fitted with a cover that helps prevent spillage as you are moving it to empty the water. It also features a small handle. This makes it easy to pull the container out of the dehumidifier. To further prevent spillage, an additional safety feature is included in the form of ‘Automatic Shutoff’. When the tank fills up, a water tank light indicator comes on and the dehumidifier automatically stops running. The unit will then remain off until you empty the tank and pop it back in. Sitting the DEX12 near a suitable drainage point means you can use the supplied hose to use the continuous drainage feature. This bypasses the water tank and removes the need to empty water from the dehumidifier. To help counter the small tank size the DEX12 arrives complete with a hose as which bypasses the water collection tank and allows the machine to continuously drain the water it collects. Although you will obviously need to place the DEX12 near a suitable drainage point – such as a sink. It was also disappointing to see that this dehumidifier does not feature an in-built programmable timer. This is a shame because it allows more hands-off and economic operation of your dehumidifier and is something we would have expected to see with a dehumidifier of the DEX12’s price point. From the function button of this DeLonghi dehumidifier comes a fourth preset in the form of a dedicated laundry mode. And, although drying clothes is not the DEX12’s primary function, it does a very good job of it. The dry clothes function brings with it a boost in power, which pushes the DEX12 to work at peak performance. According to customers, the laundry setting can dry a normal wash load in 4 to 5 hours. At this rate, the DEX12 offers a great way to dry your laundry over the wet and cold months. Overall, the dehumidifier dries clothes faster than a standard air drier. What’s more, it saves you more power compared to using a tumble-drier and prevents the condensation build-up that arrives by laying your wet clothes over a radiator. The reason why the DEX12 does such a good job at drying clothes is thanks to the integrated DeLonghi’s signature AriaDry Multi-Technology. While it is not clear exactly how the technology works, it basically increases the unit’s energy efficiency allowing it to work at maximum performance without using too much power. This even applies when you are using the clothes drying feature. The dehumidifier will dry clothes while simultaneously dehumidifying a room and still save on energy. According to DeLonghi, it is thanks to this technology that the DEX12 boasts an energy rating of A++. All dehumidifiers make a continuous humming or rattling sound (some louder than others) that can get annoying after a while. While there is no way of completely eliminating the noise, the Delonghi DEX12 offers some relief with a low noise rating of 37dB. Granted this is not DeLonghi’s most quiet dehumidifier, but it is less noisy than most models from other brands. You could sleep through the night with the DEX12 running a few feet away from you. More so on the unit’s lowest humidistat setting which is barely audible. Dehumidifiers normally experience a dip in performance in colder environments. To help counter this, the DEX12 is designed to withstand the effects of cold weather. It has an electric anti-frost device, which melts any available ice buildups before it starts running. This helps prevent damage to the condensing coils and prolongs the lifespan of the unit. Wrapping up the nice range of features on the DeLonghi DEX12 is a neatly designed filter. 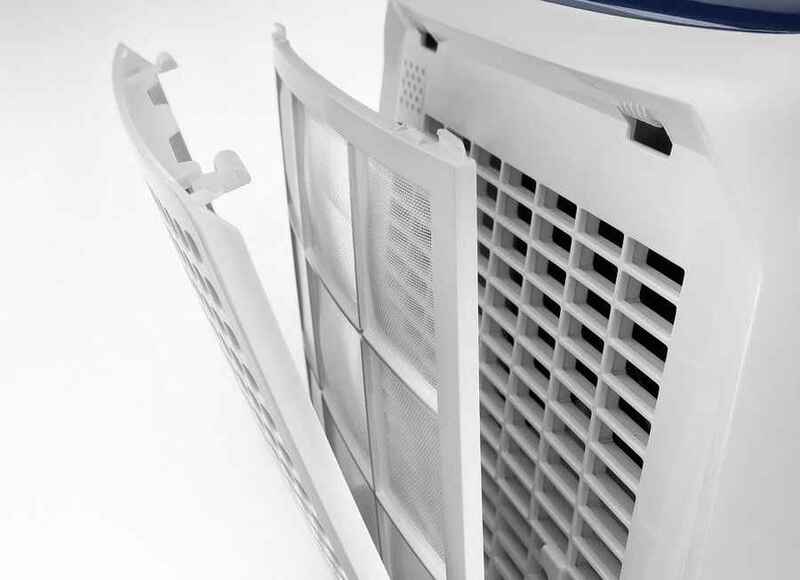 Just like the handle and control buttons, the filter integrates into the dehumidifier’s body. It is also removable and cleans easily either by being vacuumed or washed with hot water and mild soap. Make sure to clean it regularly since a dirty filter will compromise the unit’s performance. While the filter does not purify the air or rid your home of bad odours (like the carbon filters of the Finether 12L/D), it does a good job of protecting any asthmatics you may have at home – a fact that has been acknowledged by the Asthma and Allergy Foundation of America. The filter captures both dust and allergens like pollen, which are in the air, making it healthier to breathe in your home. One thing that users keep on reporting about the DeLonghi DEX12 is that it works very quickly and makes a huge difference in the quality of air. Customers are also generally very impressed by just how quiet this appliance is, the convenience received from the dry washing feature, and how the washable filter saves you money. Overall, this DeLonghi dehumidifier comes highly recommended by most users. The DEX12 is something of a mixed bag. It is lacking some features we would expect to see in all dehumidifiers in this price bracket. But, in someways it makes up for these shortcoming with a solid build, whisper quiet operation, and low running costs. It is also exceptionally light and easily trasportable for a refrigerant dehumidifier, which typically weight around 14Kg. At the beginning of this guide we mentioned that, on paper, the DEX12 was very similar to the Finether 12L/D. But when looking in-depth the DEX12 is arguably the better pick. Its bigger tank size, wider coverage, and silent operation give it superior status over its almost twin the Finether 12L/D. More importantly, the DeLonghi DEX12 is an energy efficient model with a good extraction rate and one of the fastest clothes drying features. With all of those features and benefits, it is easy to see why the higher price tag is justifiable.